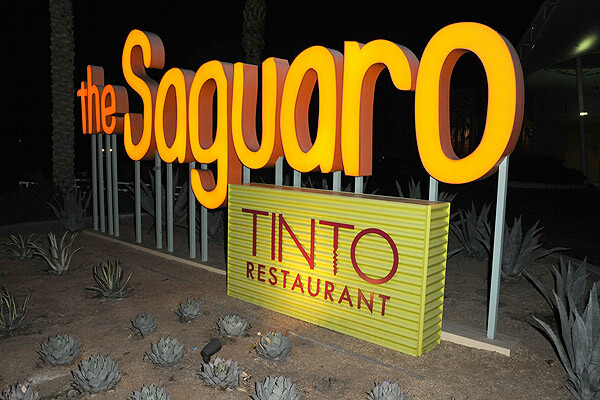 The Tinto restaurant at the Saguaro Hotel in Palm Springs, California held its second Dinner with Shag event during Modernism Week, from 7pm to 10pm on Monday, February 16th 2015. This marriage of high cuisine and contemporary art included sixty-five guests for dinner, each paying $150 USD to attend. The five-course Basque-inspired dinner, prepared by chef’s Jose Garces and Robert Sevaly, was influenced by Josh Agle’s art and paired with fine Spanish-styled wines. 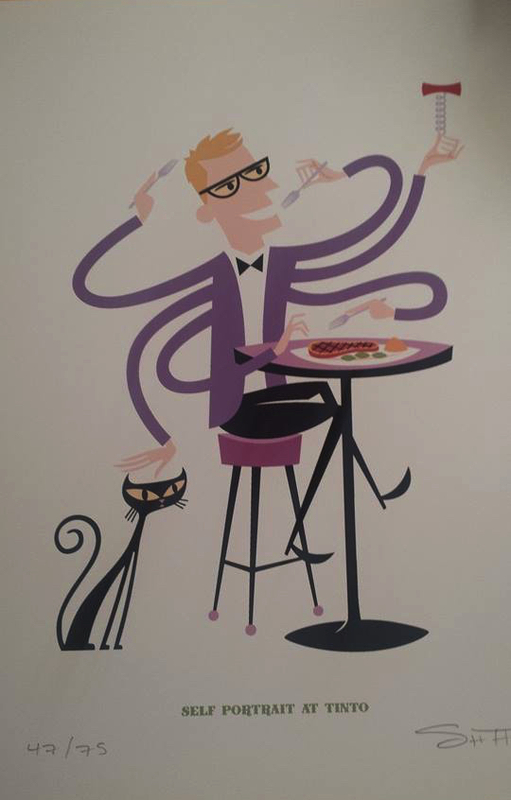 Each guest was treated with a custom menu illustrated by Shag in addition to the latest limited-edition print, titled Self Portrait at Tinto. 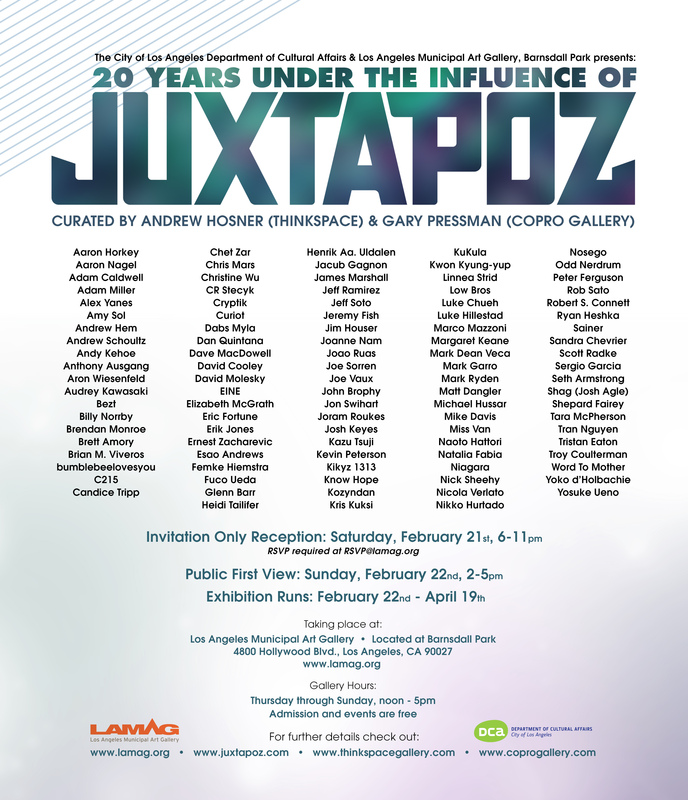 The 20 Years Under The Influence Of Juxtapoz group show at the Los Angeles Municipal Art Gallery ran from February 21st to April 13th, 2015. 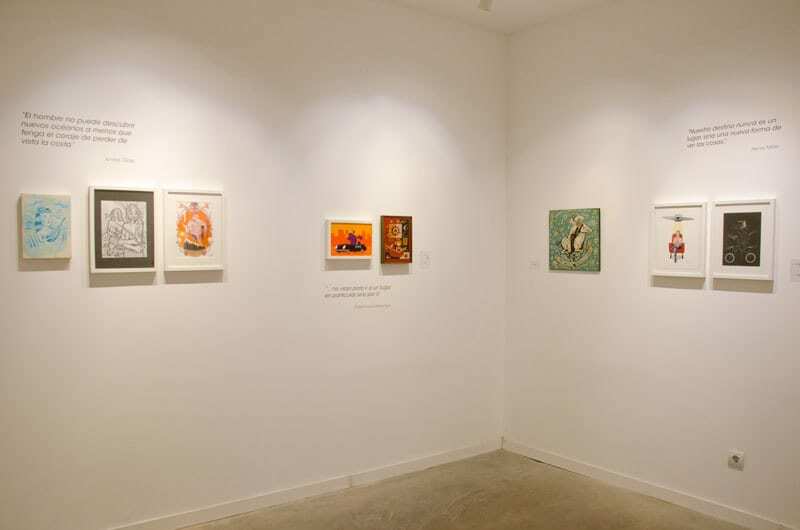 The large exhibition of over one hundred new contemporary artists was curated by Andrew Hosner from Thinkspace Gallery and Gary Pressman from Copro Gallery. 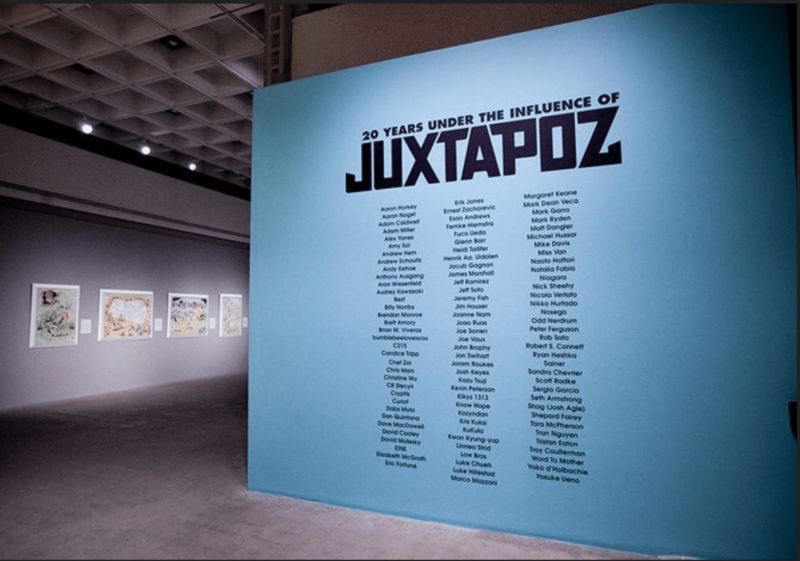 The group exhibition commemorated two decades of Juxtapoz magazine’s contribution to contemporary art and culture. 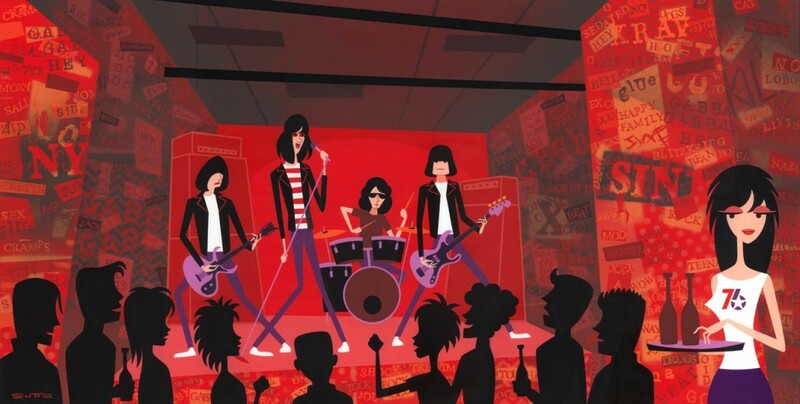 Shag’s contribution was the acrylic on panel original painting Summer of ’76, measuring 36” by 18”, which sold at $16,000 USD. 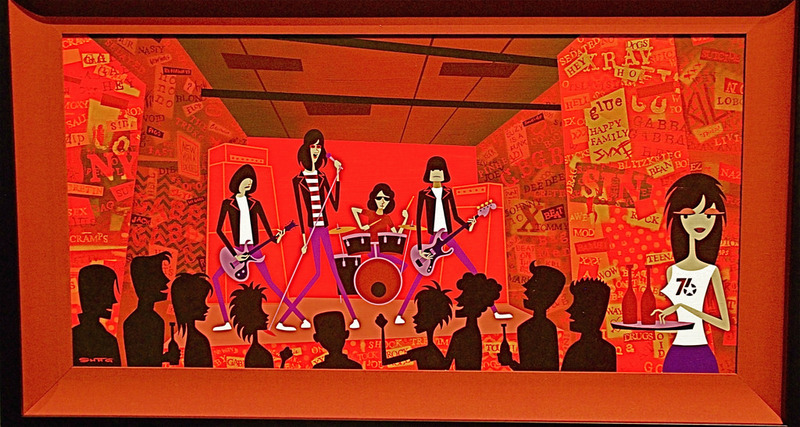 Shag actually saw the Ramones in concert in 1980 but reimagines this in his Summer of 76 painting. 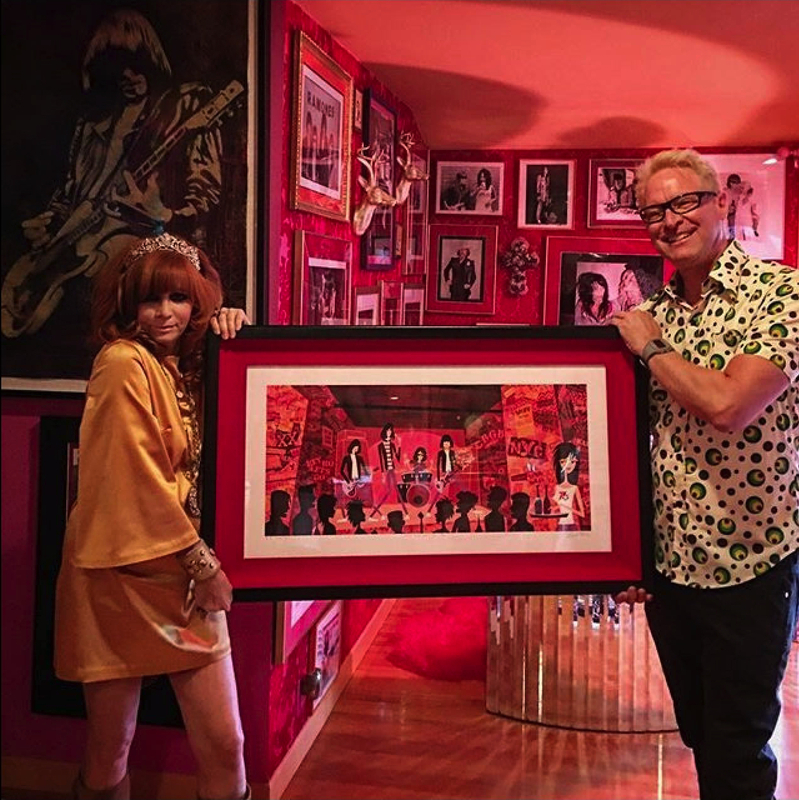 Shag is shown below holding The Summer of ’76 with Johnny Ramone’s wife Linda. 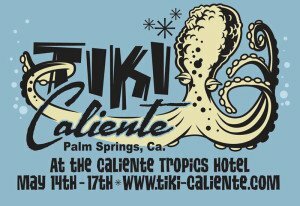 The Tiki Repeat exhibition was held in the lobby of the Caliente Tropics on Friday, May 15th 2015. 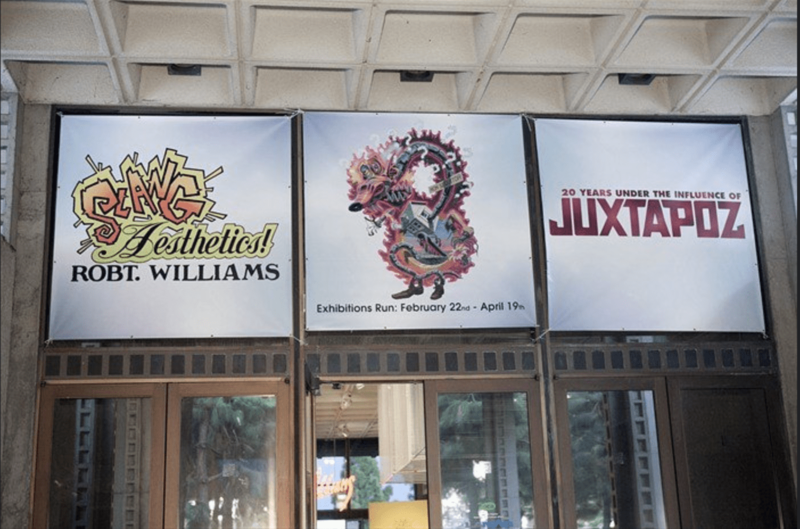 The show features pieces from the collections of Jay Nailor and MiShell Modern (owners of the M Modern Gallery and Shag Store), and Rory Wildsville Man Snyder (owner and founder of Tiki Caliente), along with pieces from Bosko Hrnjak, John Mulder, Miss Fluff and Benjamin Burch. 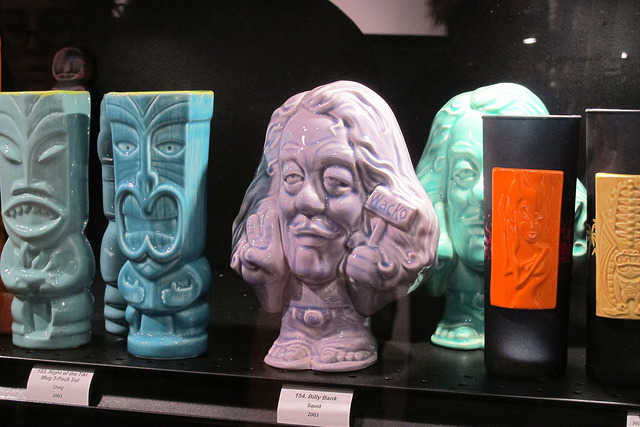 The exhibition also included ten unique Shag mugs designed by John Mulder and produced in special colorways, each numbered 1/1. 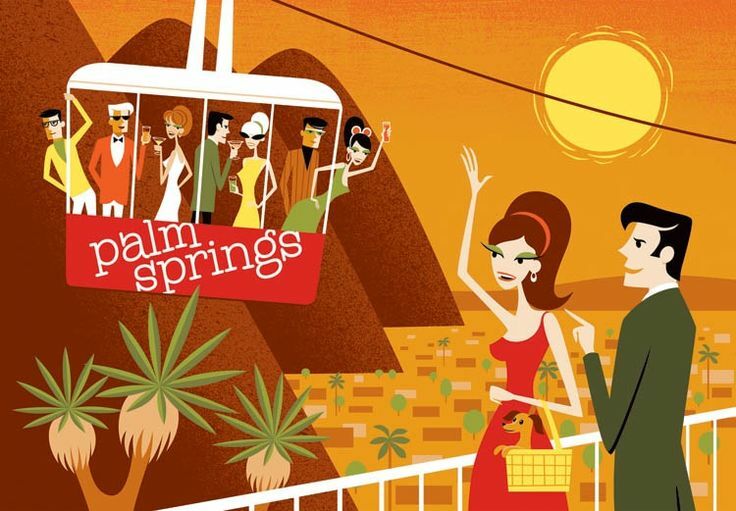 The seventeen-color serigraph The Girl from Coachella (34” by 16”) was available at the Tiki Repeat exhibition for $395 USD in a signed and numbered limited-edition of 175 prints. 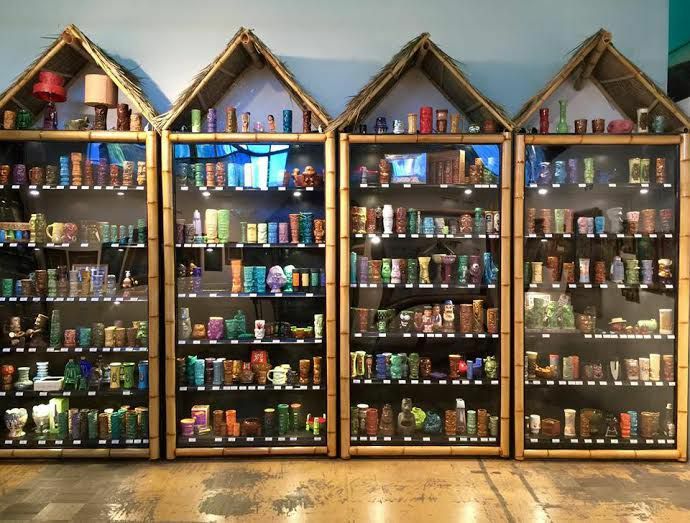 The Harold Golen Gallery staged the Big Eye Spectacular exhibit in the Tiki Treasures Bazaar of Hukilau 2015. 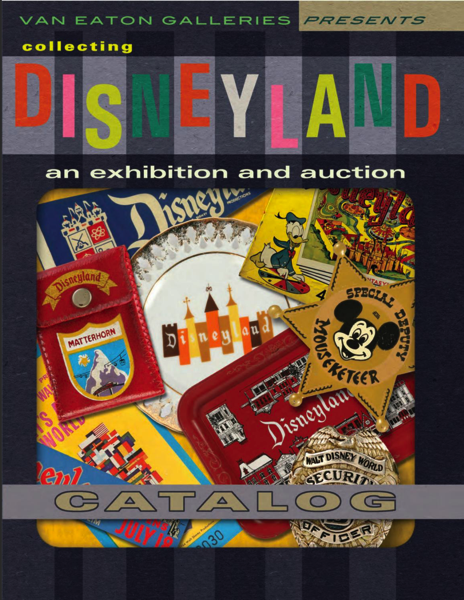 The vendor booth was open 6pm-9pm on Thursday, 10am to 8pm on Friday, and 10am to 3pm on Sunday. Each artist in this group event was asked to create a work inspired by the ‘big eye’ trend of the 60’s-70’s as featured in the work of Margaret Keene. 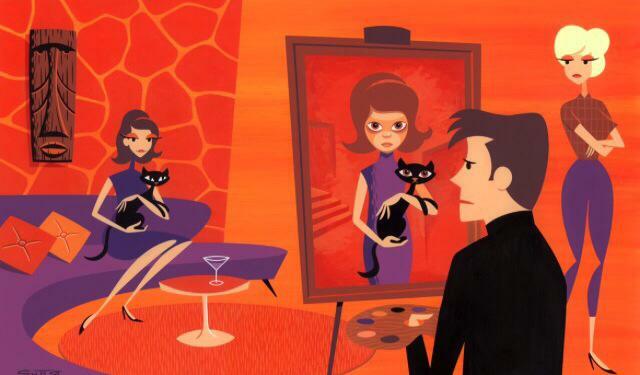 Shag’s original painting at the exhibition is shown below. 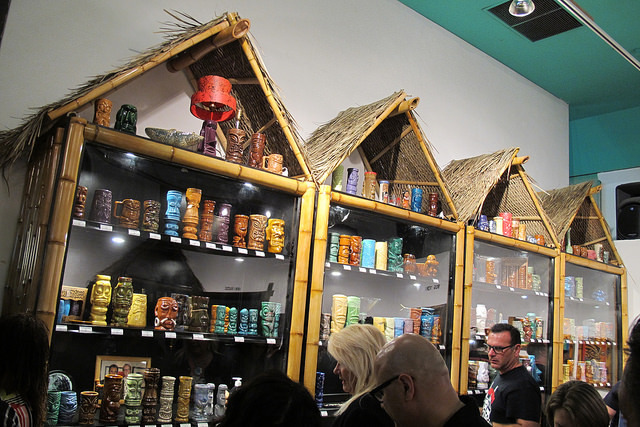 The Tiki Oasis event was held at the Crowne Plaza in San Diego, California from the 13th to the 16th August 2015. 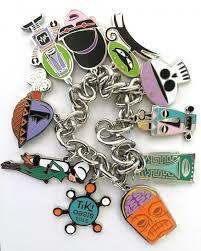 Josh Agle produced a Tiki Oasis 2015 Charm Bracelet for the event in a limited edition of one hundred. 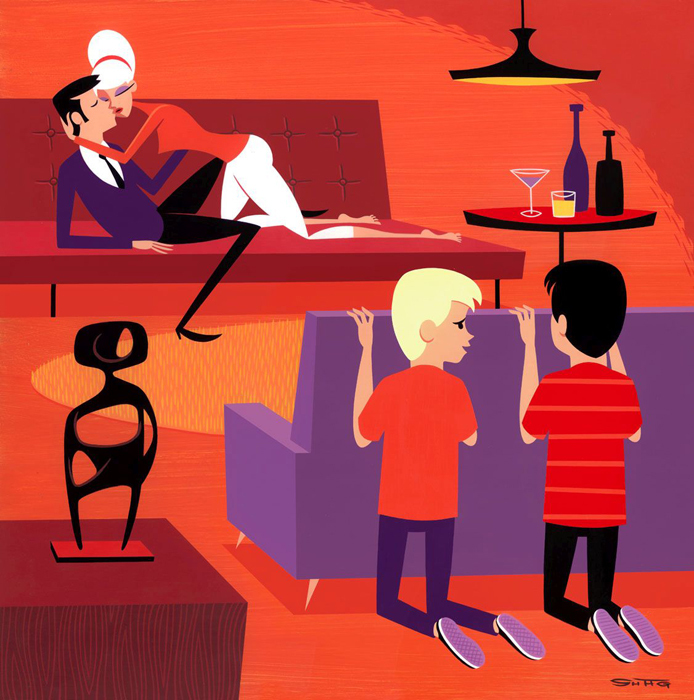 The Shag Rare Proof and Mid-Century Modern Show at Outré Gallery Brisbane in Australia ran from the 11th September to the 9th October 2015. 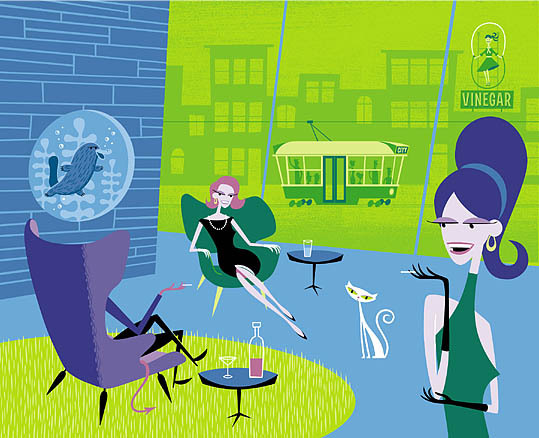 The group exhibition of sold-out limited edition and artist proof prints from Shag personal archives were shown alongside original mid-century modern architectural renderings, prints, books and objects. 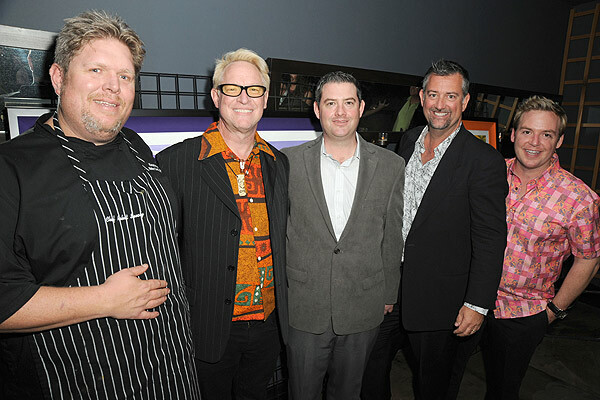 The 10th Annual BLAB! 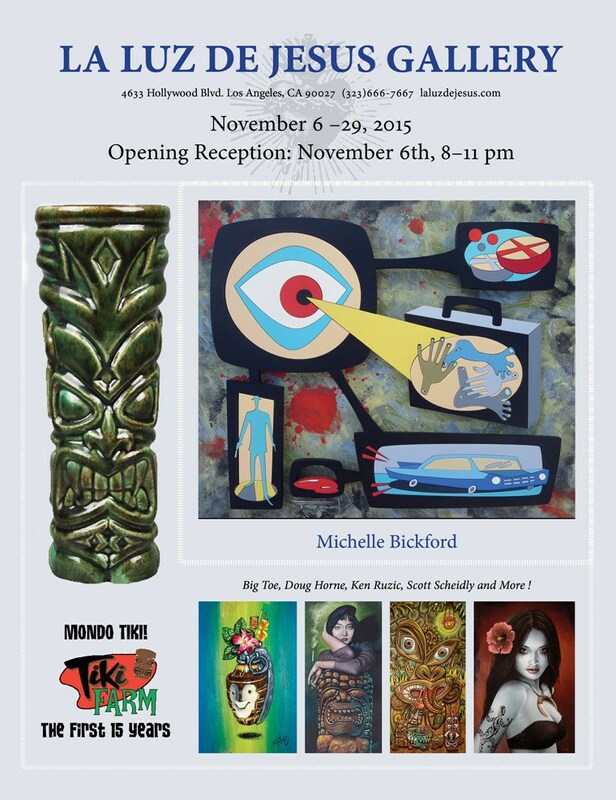 Show at the Copro Gallery in Santa Monica, California ran from September 12th to September 30th 2015. 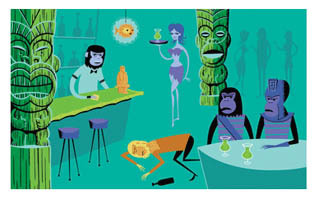 This group art exhibition featured Josh Agle’s original 19″ by 19″ The Secret Spectators acrylic paint on panel painting. 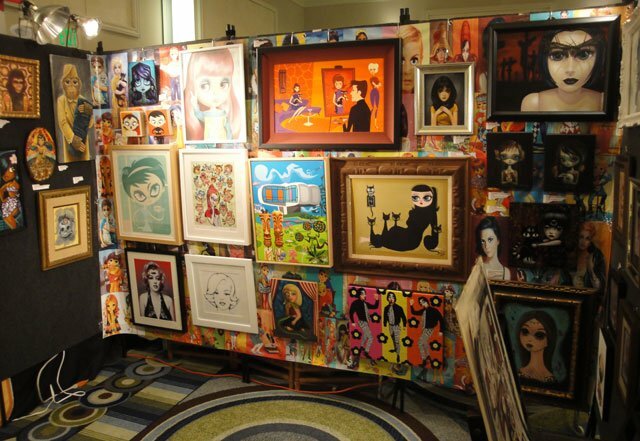 Note that Shag did not exhibit as part of the 8th or 9th Annual BLAB! Shows (2013 and 2014). 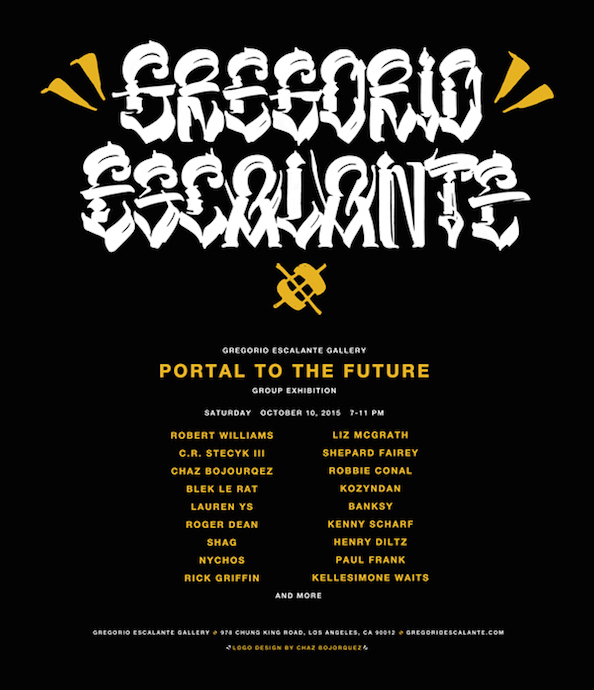 The exhibition Portal to the Future ran at the Gregorio Escalante Gallery in Los Angeles from October 10th November 11th 2015. 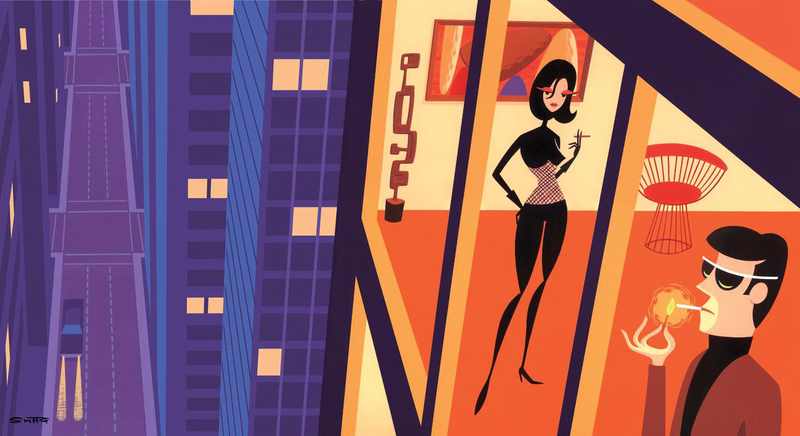 The gallery included the Josh Agle acrylic on panel original painting The Orange Floor which measures 24″ by 13″ and was priced at $10,500 USD. 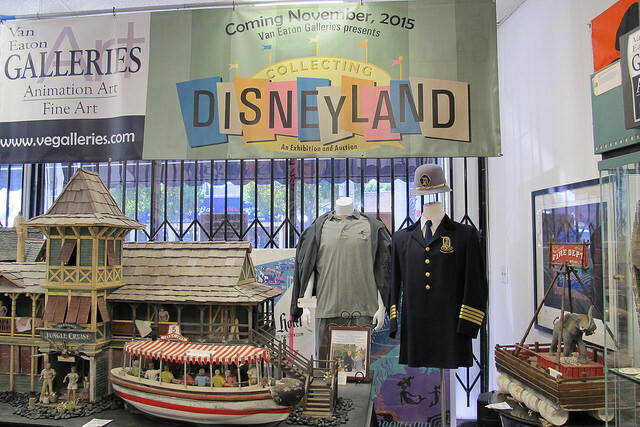 Van Eaton Galleries in Sherman Oaks, California from October 29th to November 20th 2015. 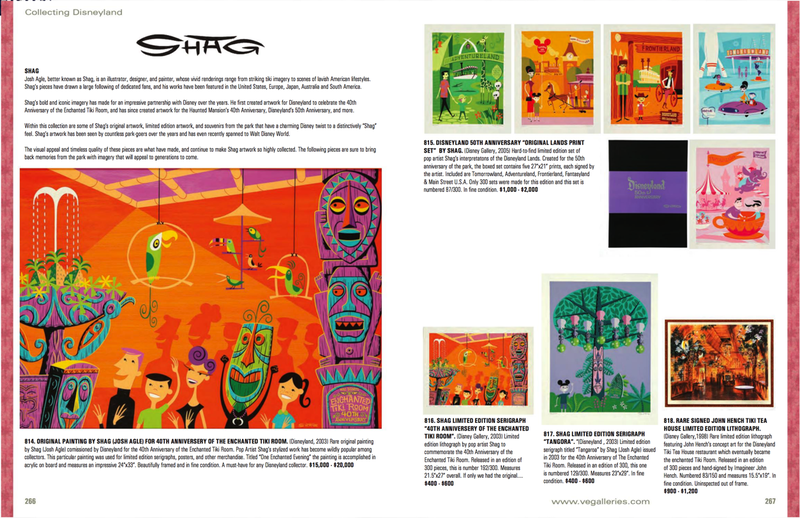 The auction ran on Saturday, November 21st at 11am and included the original painting and print of the 40th Anniversary of the Enchanted Tiki Room, plus an Original Lands print set, and Tangora print. 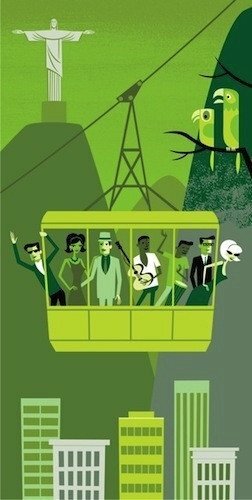 Josh Agle’s work can be seen on pages 266 and 267 of the auction catalog. 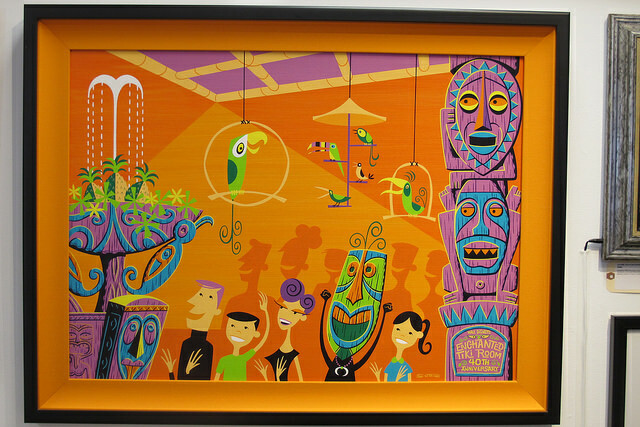 The Enchanted Tiki Room original painting sold for $15,000 USD at the auction. 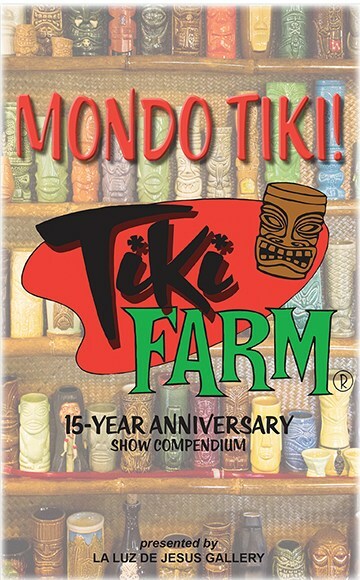 The La Luz de Jesus Gallery in Los Angeles, California ran the Tiki Farm: The First 15 Years exhibition from the 6th to the 29th November 2015. 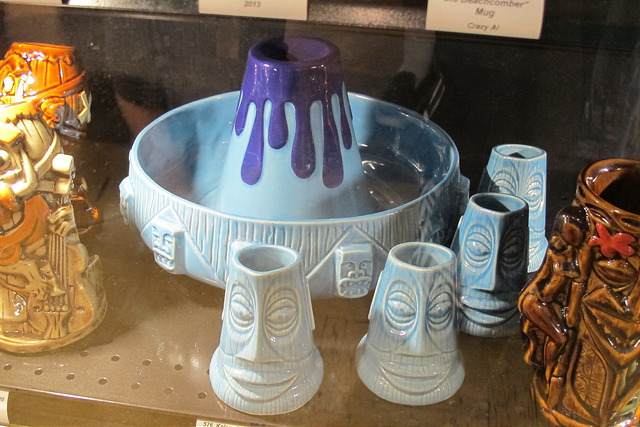 The 600+ mugs included Shag designed pieces. 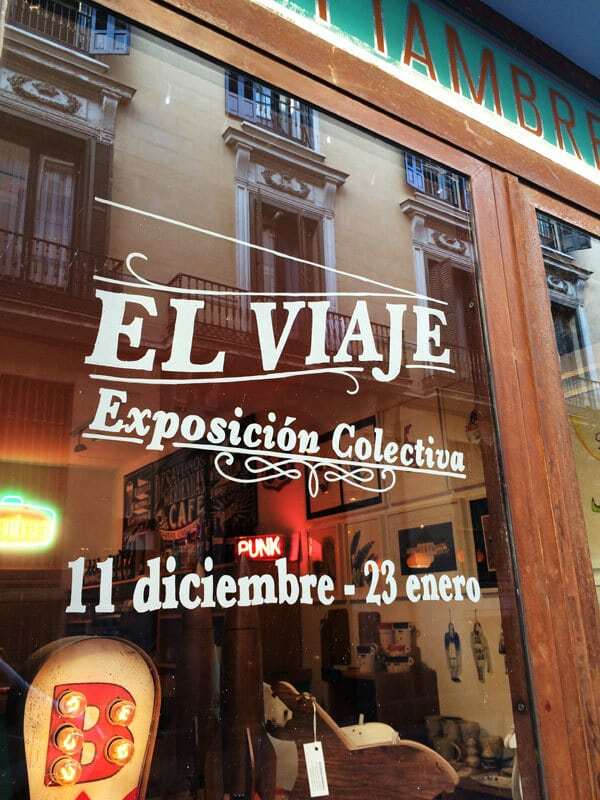 The Journey (El Viaje in Spanish) was a group art show at the Fiambrera Art Gallery in Madrid, Spain. 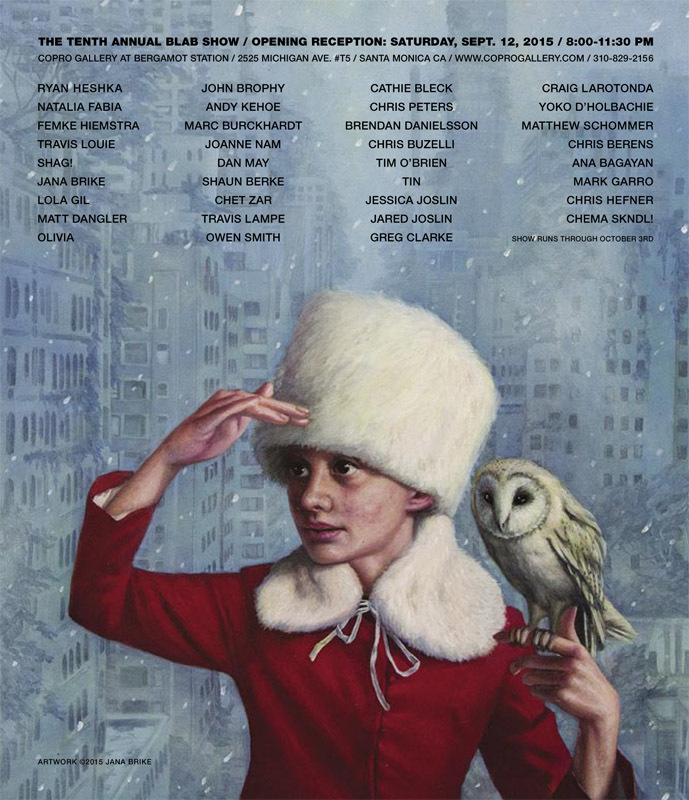 The gallery celebrated its first year with eighteen national and international artists focusing on illustration, lowbrow art, and urban art. 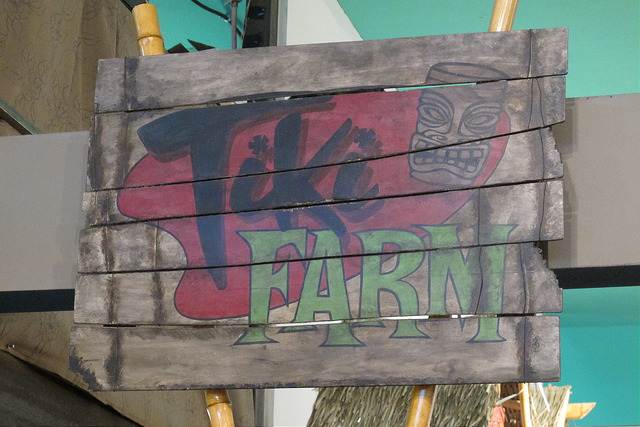 The show ran from the 11th December 2015 to the 23rd January 2016. 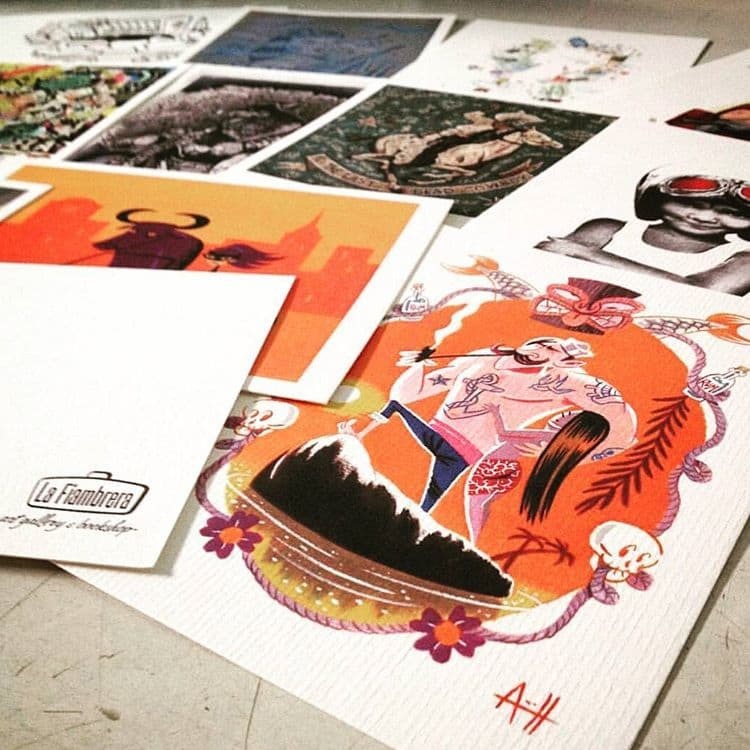 Ruth López-Diéguez and Maite Valderrama partnered to launch La Fiambrera as a gallery dedicated to illustration, and also as a specialist bookstore and event space. 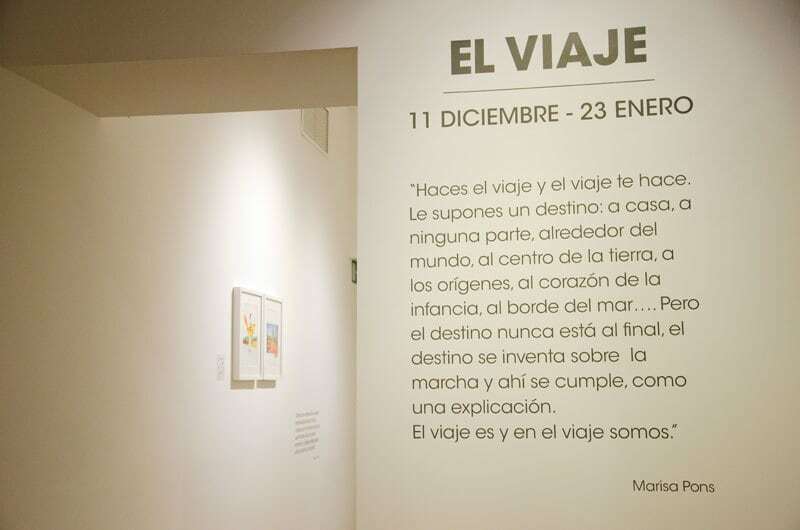 For its first anniversary, the gallery asked artists to carry out an original work with the theme that “La Fiambrera is an experience that we live as a journey in which we have embarked” and which could be defined with Marisa Pons’ words “You make the trip and the trip makes you. You suppose a destiny: home, nowhere, around the world, at the center of the earth, at the origins, at the heart of childhood, at the edge of the sea… But fate is never at the end, fate is invented on the fly and there it is fulfilled, as an explanation. 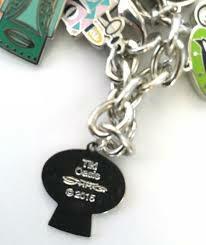 The trip is and on the trip we are“. 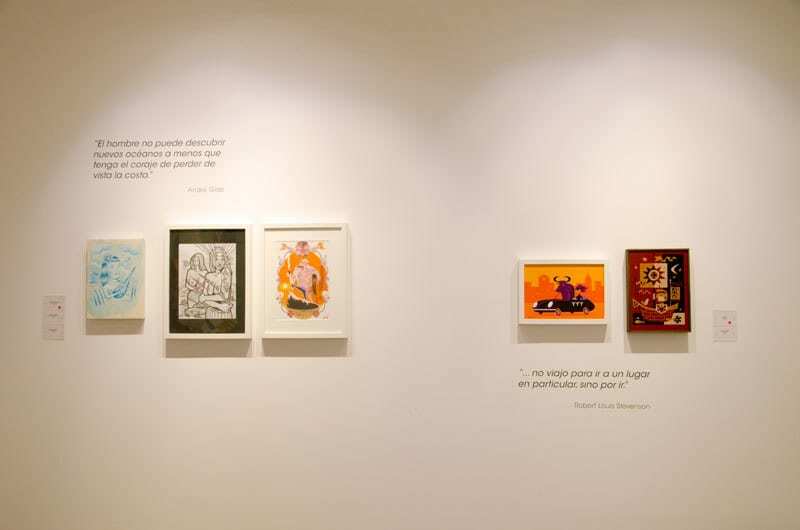 The exhibition included eighteen new original drawings in which ‘the journey’ is the protagonist. 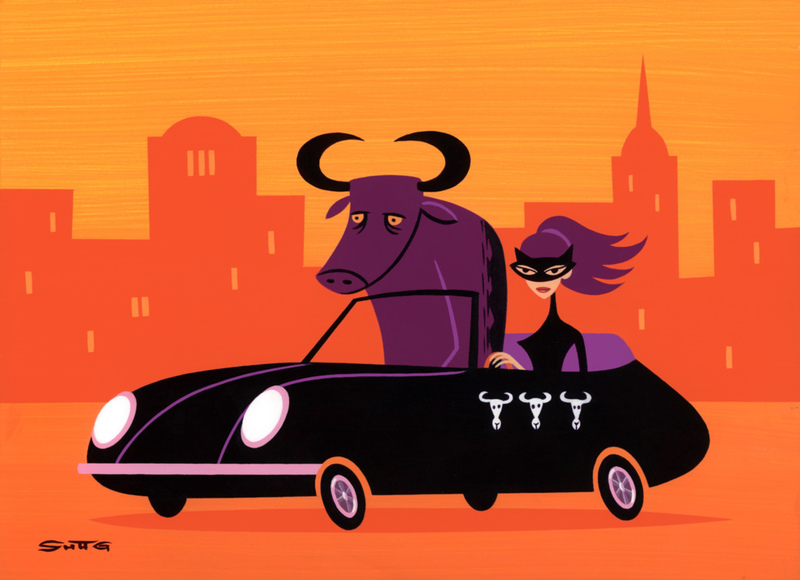 Josh Agle’s contribution was the acrylic on panel painting Bull Ride. 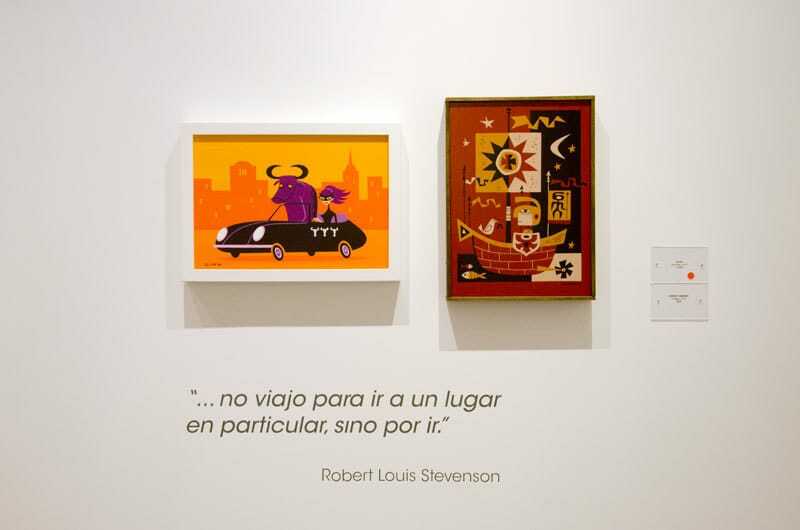 Shag’s painting appeared alongside Derek Yaniger’s Voyage, both above a Robert Louis Stevenson quote “For my part, I travel not to go anywhere, but to go” which is an ideal quote for the exhibition as it ends “I travel for travel’s sake. The great affair is to move”. The eighteen new works created for The Journey exhibition could be purchased together as prints in a limited edition box-set collection. 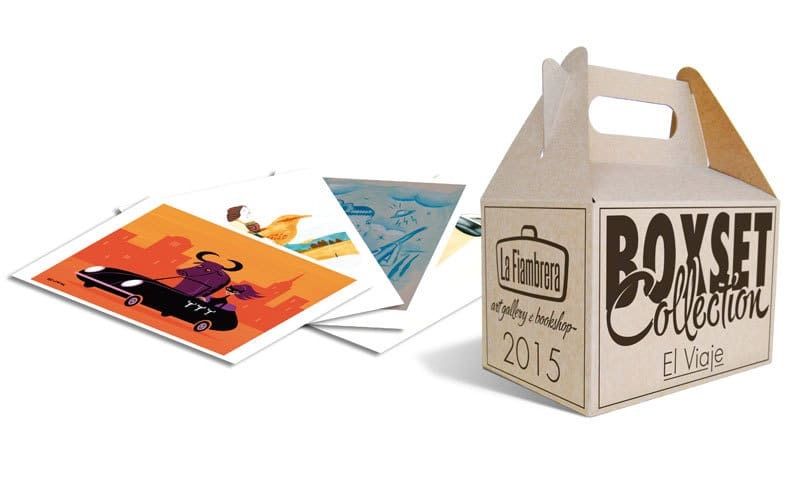 This collectable ‘lunch box’ contained a portfolio of this first collective exhibition organized by La Fiambrera. This fun play on words comes from the translation of La Fiambrera which means The Lunchbox. Each of the eighteen giclées measures 41” by 5.8” (A6). The box-set collection of The Journey was limited to just twenty-five copies and was priced at €45.00. 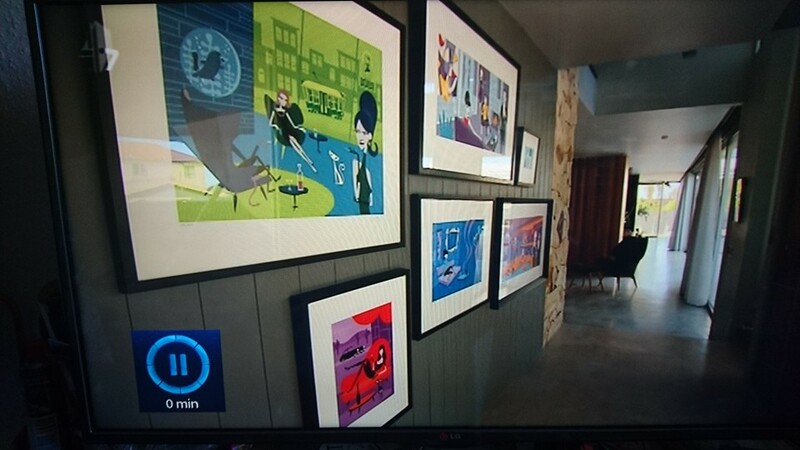 Grand Designs Australia aired series 6 – episode 7 on the 17th December 2015 to an estimated 66,000 viewers. The episode is called Northcote Vinegar Factory and was filmed in the Melbourne suburb of Northcote, Victoria. The Skipping Girl Vinegar Factory was designed by sustainable architect Adrian Light.